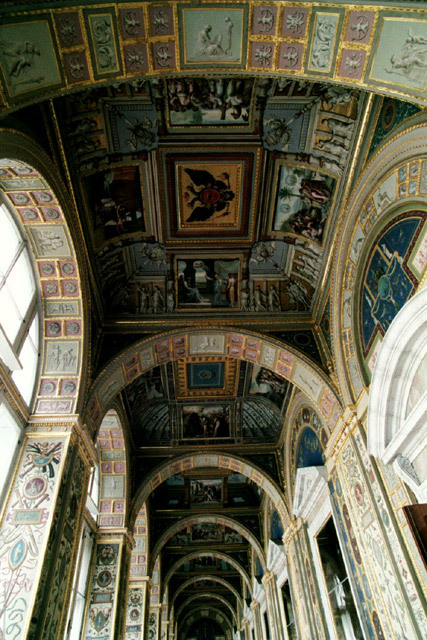 - Hermitage Museum . . . . Finish St. Petersburg (home stay on Gorokhovaya) N59º56.353' E030º18.898' 7 meters . Weather: Overcast and cool with occasional rain. We have a bit of a lazy morning as we have decided to spend the day at the Hermitage as the weather looks like there will be some rain. We are ready to head out shortly after 10:30 AM and make our way over to the Hermitage. We first wander around the Palace Square taking in the grand buildings that surround us. 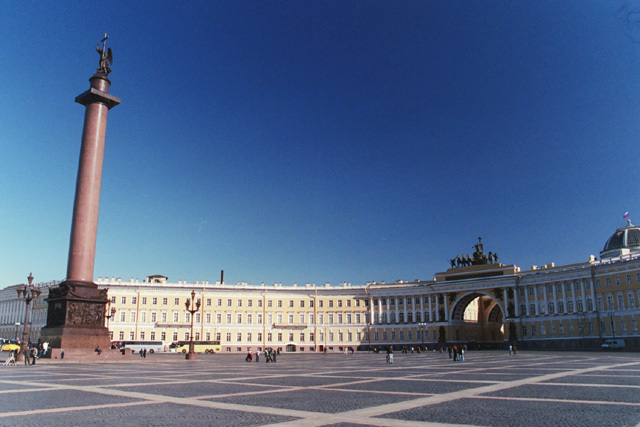 There is the Winter Palace on one side, facing the General Staff Building on the other with the tall Alexander Column in the middle. To the side of the Winter Palace is the original Hermitage. 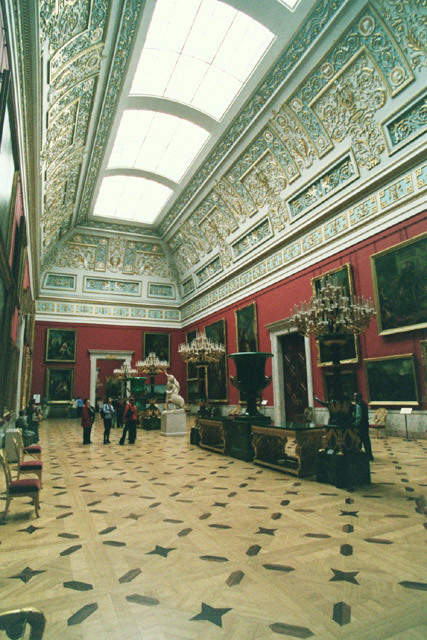 The Hermitage has now expanded to include the Winter Palace and parts of the General Staff Building. St. Petersburg is a very grand city, a result of the far reaching and, well, grand visions of Peter the Great who built this city in 1703 as the new capital of Russia in the swamps on the banks of the Neva River, which he had secured from the Swedes through military action. This is the appropriate place to go into the history of this city, but suffice it to say that it was through the will of Peter the Great that this became a city to rival many of the greatest of Europe. 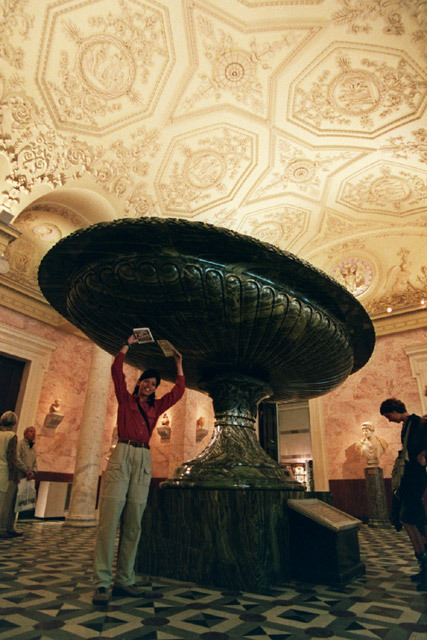 And the Hermitage museum is certainly one of the greatest in the world. We had no time to waste as there is so much to see. Apparently there are over 24 km of halls and exhibits that can be viewed, so we have our exercise set out for us today. We pay our fee (a significant multiple of the local price, but at least this ticket is worth it - this is a full day affair), and enter the museum. We have a quick bite to eat in the small cafe and then begin our wandering. We cover a fair chunk of the place, but some of it at a fast pace, just getting a quick look. We begin at the vast, sweeping Jordan Staircase and then head up to the temporary Peter the Great exhibit. It is a very extensive display covering all aspects of Peter the Great and his rule, including some of his many drawings and plans for St. Petersburg. There is also a display of some of his undergarments. It is amazing what was saved and not destroyed. Then it is on to the Malachite Room, where over two tons of this stone was used in the columns and vases. 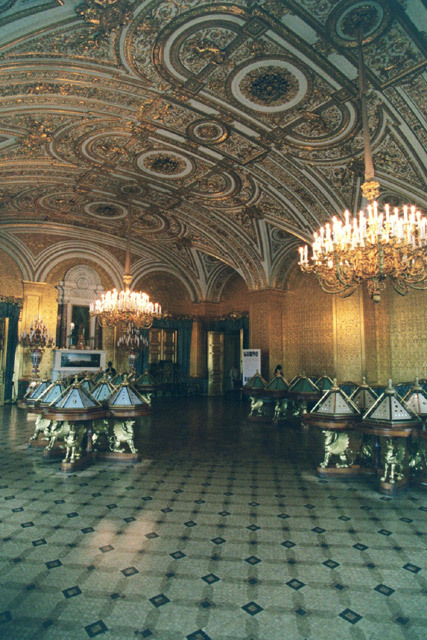 The gilded ceilings and door frames and parquet floor are stunning. What is nice is that large chunks of the wall are left a simple white, allowing the malachite and gold to stand out. From here we went to the State Rooms with the dark, wooden Gothic Library, the Crimson Study, boudoir and bathroom. 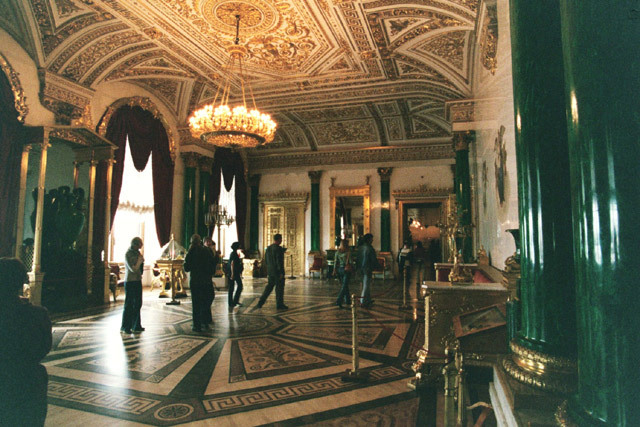 At the other end of the wing we came upon the Gold Drawing Room and then the White Hall, decorated for the wedding of Alexander II in 1841. Making our way around the four wings, we came at the other end upon the Alexander Hall, used for receptions. 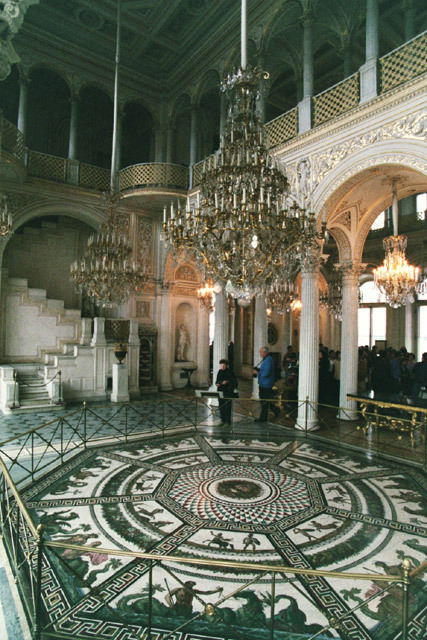 In the church of the Winter Palace, a special exhibit on stained glass was showing. Next was the 1812 Gallery, with the countless portraits of the Russian military heroes from the Napoleonic wars. We get to the Small Throne Room through the Armorial Hall and the Hall of St. George. 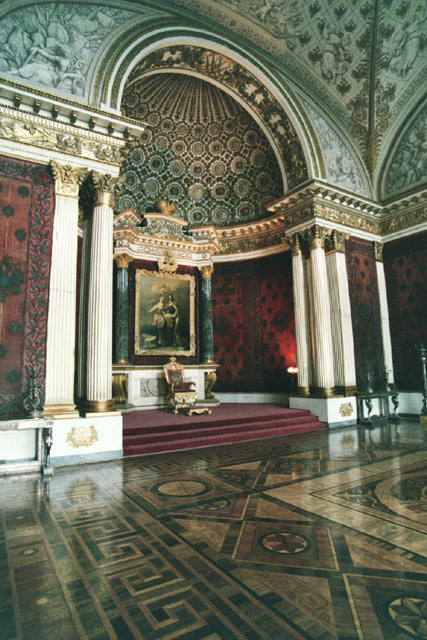 The Small Throne Room is very impressive with its red silk walls, white columns and gilded ceiling. We now spend more of our time focusing on the displays of art. They certainly have some stunning pieces and we slowly make our way through the exhibits. This grand old building certainly is the place to exhibit some of the massive paintings that they have in their collection. Some of the paintings are so huge that the people are bigger than life-size. They soar high above us and, to get a decent look, you have to stand at the other end of the hall. We see a wide range of paintings, too many to list here. But there were certainly masterpieces in all senses of the word. 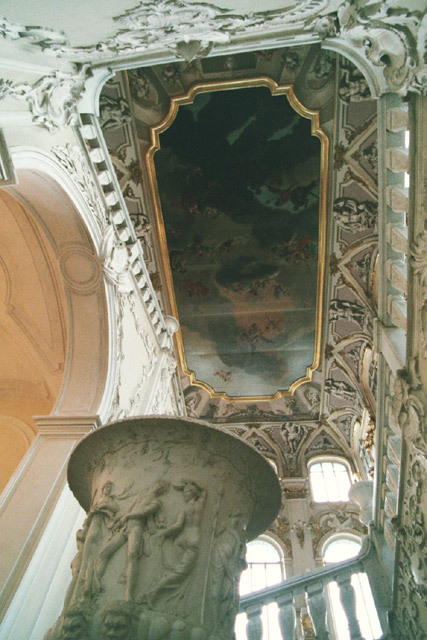 We just wish we had more time and some additional benches on which to sit down and admire the paintings. By this time our feet were getting very sore and tired. In our last hour we had just enough time to take in the upper level with the 19th-20th century European art. Then, we tried to make our way to the exit, getting a little lost in the classical section. We leave the museum at 5 PM just as they are closing down for the day. Once back on the street, we decide to go in search of the Hermitage Theater, where we noted some performances were being staged. After some wandering up down the embankment on the Neva, we find the very discreet entrance and go in to see what they have to offer. It turns out that they have no ticket office here and you have to buy the tickets in town. So, once again we head back down Nevskiy Prospekt going through the Palace Square and the huge gate under the General Staff Building to the central ticket office. We enquire about tickets for the ballet at the Hermitage theater and find out that they are asking for over $100 per ticket. And that is for any seat in the theater. We also find out that locals pay a lot less. We decide to forget about going to see this show - we are not even sure who is producing it and how good it will be. Well, we are very hungry and thirsty by this time - we had barely anything to eat and drink all day. So first stop is at a cafe for a drink and a snack. Then after we do some quick shopping, we decide to have dinner. It is now almost 8 PM. We head over to the Stroganov Palace - how could we pass on having Beef Stroganov at the palace of the man who came up with this tasty dish. There is a cafe/restaurant in the courtyard of the palace which is currently going under renovation. It is a bit tacky, with telephones on each table so you can call people at other tables (it is most likely a prime hangout for prostitutes) and the service is very slow, but the Beef Stroganov turns out to be pretty good (even if a bit pricey). After dinner, we decide to wander around some of the shopping centers that line the street. We wander by Kazan Cathedral to Gostinyy Dvor, which has been St. Petersburg mini-bazaar since the 18th century. 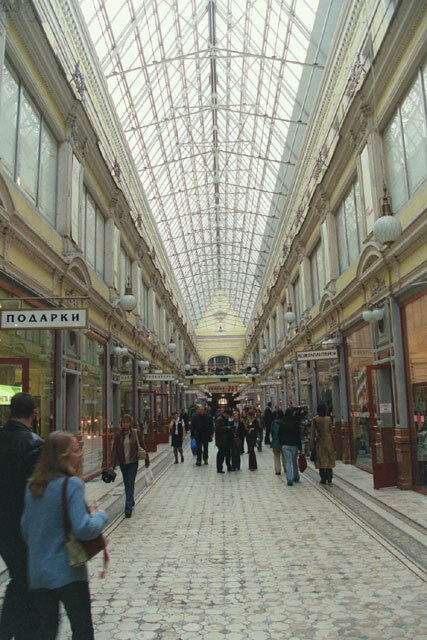 It is filled with countless small shops and a few large department stores. We check out some of the souvenirs on sale and as the shops begin to close slowly make our way back to our home stay.